Now “2010 FIFA World Cup South Africa” excites people in the world. In Japan, even those who don’t usually care for soccer watch the games on TV and cheer the Japanese team. At “nakata.net cafe” in Shibuya, Tokyo, soccer fans get together and watch the world cup games while enjoying the selection of gourmet foods from all over Japan. This cafe is produced by a famous former Japanese soccer player, [W:Hidetoshi Nakata], and provided as a “Japanish space” where “fans can enjoy cheering their team on in uniquely Japanese style”. 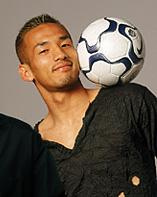 The cafe serves the foods that Nakata found throughout the country while traveling after him retired from soccer. On the menu, there are for example, shabu-shabu, pork cutlets, udon, curry, and croquette. One dish that amazed me was “tamago-kake gohan” which is “beaten raw egg with soy sauce on rice”. Like I said in the past post, it is a common dish in Japan. But I had never seen a cafe which serves it, and what surprised me was the price; it is 1,200 yen (US$13)!! Hmm…it sounds delicious. Since I love “tamago kake gohan,” I want to try it! By the way, it doesn’t mean the other foods are expensive there. For example, the croquette is 200 yen (US$2) and udon is 680 yen (US$7.60). 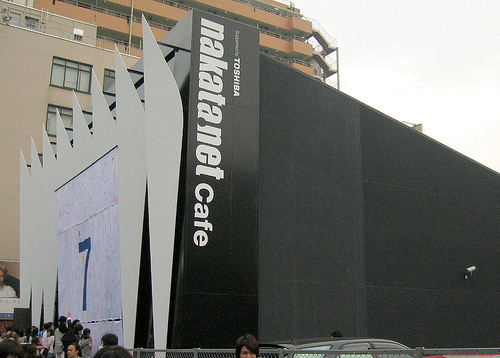 The cafe opens till July 12, so if you are in Japan, and interested in the gourmet foods, why don’t you visit nakata.net cafe? Jellyfish Restaurant at Kamo Aquarium: Enjoy Appetizer to Dessert!